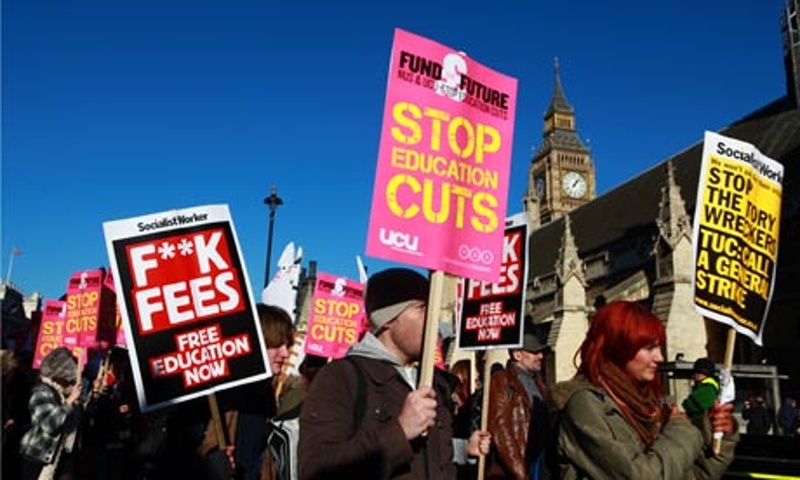 Up to 10,000 students are expected to take to the streets of London today in a national protest calling for an end to tuition fees and a re-instatement of the maintenance grant. Currently more than 500,000 students from poorer backgrounds receive a maintenance grant from the government, worth around £1.6bn a year. Earlier this year Chancellor George Osborne announced plans to scrap these grants altogether, replacing them with maintenance loans. Critics have said the move will put the poorest off attending university. Today's protest – organised by Student Assembly Against Austerity, the National Union of Students (NUS) and the National Campaign Against Fees and Cuts – will call for the government to rethink these plans. Shakira Martin, NUS vice president for further education said students need to stand together for free education. "Our colleges and sixth forms are under attack by this Conservative government from right, left and centre, with continuous cuts being made to our institutions, our courses and our resources," she said. "It is important that we stand together as a student movement to campaign for free education, for everyone to have access to quality teaching, learning and assessment and the opportunity to break the cycle of deprivation." Barbara Ntumy from the Student Assembly Against Austerity National Committee said: "We are marching today to voice our opposition to what the Tory government is doing to our education. "£9,000 tuition fees make Britain one of the most expensive places to study in the whole world. This disastrous policy means millions of young people are starting their working life with a lifetime of debt. The truth is that most of us will be lucky to pay it all off before we retire. "Now the government is seeking to make the situation even worst by taking away the last line of financial support for the poorest students. The scrapping of maintenance grants is going to plunge millions of students into an extra £10,000 worth of debt. A study from the NUS earlier this year found that 1/3 of students say maintenance grant cuts would stop them going to university. NUS president Megan Dunn said the Government needed to "sit up and take note". "Local and national action must be taken in order to secure a U-turn on maintenance grants," she said. "We must also tackle the causes of this crisis and cut the costs that are pricing the poorest out of education. A study by Student Money Saver earlier this year found that students are struggling considerably with rising fees and rents, with 73% of students saying their maintenance loan isn't enough to live on, and over 40% of students saying they had skipped meals due to money concerns. Protesters will meet today in central London and will march past Parliament, the Home Office and the Department of Business, Innovation and Skills.